Patients are the most important for us! An honest and beautiful smile, a hearty laugh are important elements in our life. The healthy and beautiful teeth contribute to this. We know that dentistry means fear and pain for many people. However, these are not inevitable parts of the dental treatment! We do accurate, fast, painless and precise work. The greatest acknowledgment for us is when patients leave happily, satisfied, and of course smiling. I started my private practice in 1987. We have 13,000 registered patients. Dentistry is not only my job, but it is also my profession. My work is mainly characterized by accuracy and rapidity. I consider it important to always be up-to-date in the latest methods of dentistry, therefore I always attend further trainings. I have been doing implantations since 1992. Before I apply an implantation system, I always obtain thorough information about it, and attend the related courses. This is why I attended the courses of Bauer, Denti, Unimplant, Branemark, Straumann, Ankylos and Zimmer Dental-Swiss plus, however, I prefer working with one of the most modern implantations, the Camlog, the annual further trainings of which I always attend. In connection with implantation, I have also attended paradontal regeneration and osseo-integration (Bio Oss-Geistlich) courses. 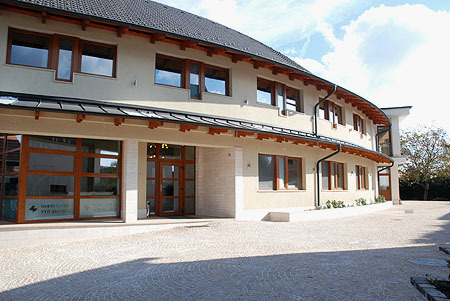 We welcome our patients in Pilisvörösvár, in calm environment. The dental waiting room and the surgery rooms are air conditioned for your comfort. The surgery rooms are light, friendly and sunny. We pay great attention to cleanness and hygiene; the surgery rooms – and especially the equipment – are sterilized with the most modern sterilization techniques. Five dentists work in our team. The assistants and the dental mechanics are also important in our team work. Though they work in the background, they focus on your satisfaction. We only use excellent quality products in our work. We provide the most modern treatment methods for our patients. We consider it essentially important for our doctors and assistants to attend further trainings so that we could provide the best service for you.